← Is Vikram Pandit in Favor of Real Reform? 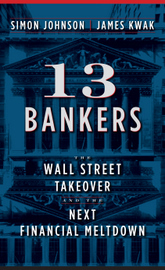 The first generation of financial crisis books was largely blow-by-blow, behind-the-scenes accounts, like David Wessel’s In Fed We Trust and Andrew Ross Sorkin’s Too Big to Fail — long on characters, events, and dramatic suspense (or at least as much dramatic suspense as you can have when writing about something that unfolded on the front pages of the newspaper), but relatively short on analysis. There were also more analytical books, like Justin Fox’s The Myth of the Rational Market and John Cassidy’s How Markets Fail, which seem like books about free market economics that later turned out to be about the crisis. But one thing this crop had in common is that, for the most part, they ended with the near-collapse of the financial system. Unsurprisingly for readers of naked capitalism, ECONned stands out for its treatment of the complex securities and especially the trading strategies that helped inflate the bubble and exacerbate the crisis. I’ve been reading about this stuff for a long time now, and there was still a lot I learned, particularly from Chapter 9, “The Heart of Darkness,” which describes how trading in CDOs built out of mortgage-backed securities drove mortgage lending, and not the other way around. In the conventional account, unscrupulous lenders and investment banks were the creators of those toxic assets; in Smith’s account, at the peak in 2006, it was traders who were shorting the housing market who provided the equity that funded all those subprime mortgages. But there’s another point that Smith makes that I found particularly memorable. She tells the fictional story of XCrop, a new, bioengineered food that is nutritionally complete and cheap to produce — a solution to malnutrition and obesity all in one. But twenty years after becoming popular, and after having become the mainstay of the food system (replacing today’s current staples), XCrop is found to have serious harmful effects on human health. Shifting back to today’s foods would be healthier, but it would be difficult and expensive. Recent financial technology, Smith says, is like XCrop. The point she is making is that our policy objective should not be to get us back to the good old days of cheap mortgages and widespread securitization as quickly as possible so we can return to the outsized consumption of the past decade. We need to have a healthier financial system, and to get there we have to give up the wonder food that turned out to be so harmful to the economy. Instead, however, Smith argues that much of the government has been captured by the financial services industry — the inventors and manufacturers of XCrop. And so, at the end of the day, and despite the central role that free market economic orthodoxy played in producing the crisis, the problem we face is ultimately one of politics. I’ve just started Freefall, and it has me thinking about a problem with the too big to fail hypothesis, which Stiglitz (among others) states as: (1) compensation aligned to stock price gave bank employees incentives to focus on the short term, and (2) believing that they are too big to fail, banks took on longer term risks. But why is (2) even necessary? Why does a banker who only cares about his short term compensation care whether his firm is bailed out by the government or goes bankrupt? Either a bail out or a bankruptcy has basically the same impact on the banker – either he gets fired or he makes it through but regardless, he is somewhere else in a year or two. Which is not to say that sheer size isn’t a societal problem. But I’m not so sure that an implicit government guarantee is what drove risk taking. This is bound to be an unpopular sentiment, but I think this is not ultimately a political problem so much as a broader cultural phenomenon. As a culture we have come to think in terms of a short time horizon: what do I get now versus what will the consequences be over time. I think for most people the injustice at the heart of this crisis is that their false standards of living have been yanked out from under them while those in power get to keep theirs. But most Americans are happy to live in the moment without caring about the cost – to shove fast food down their throats with no thought about obesity, to “buy” a house they cannot afford without thought to what the payments will be a few years later, to drive massive cars without caring about the environment, etc. Bankers and politicians just get to do this on a larger scale. Bankers think about the fees they make now, how it will support their inflated egos and allow them to have the “right” lifestyle, not the fact that they are driving the country that they live in to the brink. Politicians think about the alliances that will allow them to survive the next election style, not about the effects of frustrating genuine reforms. This is not so much capture as symbiosis. But we’ve all participated in a paper economy for decades now, and we’ve all come to feel entitled to a standard of living that does not exist in reality. We are squandering the resources we did have going into this crisis trying to keep this illusion alive and fighting over who gets the best part of the illusion. Darwin my provide some direction. “While members of the Senate Banking Committee debate proposals to fix the nation’s broken financial system and ineffective approach to protecting consumers, Elizabeth Warren has one message: Pass a strong bill or nothing at all. “My first choice is a strong consumer agency,” the Harvard Law professor and federal bailout watchdog said in an interview with the Huffington Post. That’s the conventional view and frankly it’s just lazy thinking that gets you there no matter how well you express it. The ‘lifestyle’ argument is hackneyed and shallow. What Yves describes turns that conventional prejudice on its head. What she describes is a program where short sellers found a key to gathering huge pools of money to lend to homebuyers. The pools grew so large that lenders didn’t care who they lent to. The loans were packaged into securities,tranched, and sold; buyers of the higher rated layers – banks and institutional investors. The middle layers were traded among the dealers. The short sellers bought the bottommost layers then massively shorted ,through CDS, multiples of the next highest levels, that were guaranteed to fail.The folks on the other side of the CDS, buyers of synthetic CDOs, got reamed. It was designed as a mechanism for theft. So the outsized profits didn’t come on the backs of the ‘stupid’ banker who lent the money or on the greedy, 4 car, mcmansion buyer, who worked at the 7-11. They came 1.fom the suckers who funded the loan through the security,(that’s you and me baby, through our mutual funds, pension funds,IRAs) and 2. the real gravy came from the ones who sold insurance in multiples of the mcmansion loan. (again that’s folks like you and me). Now who’s the least attractive guy here, the guy who’s having money thrown at him to buy an overpriced house he can walk away from, or the guy who sets up the whole scheme and walks away with your savings , and destabilizes the global economy to boot? The myth of the greedy aquisitive middle class gluttons getting their cummupence is especially galling in light of this scenario. The ones that had the most to loose (and did) were the middle class savers whose savings were looted as a result of these machinations. Adding insult to injury, housing prices were driven higher from the bottom up as a result of this flood of money. Who loses here the most, the guy who can walk away or the family paying an excess premium for a house in a school system. See E Warren’s take on where the middle class spends its money since 70. Turns out its on 2 things houses, for the school disttrict, and health care. Sure they own more cars, but spend the same on car/transport as they did in 70 dollars. And they have nothing left over. The winners are the housing speculators that got out in time and the looters who set up the game. What a mess greed-based capitalism has made of the world! Isn’t it fun worshipping immoral pigs? Et tu, Obama? I understand the strategy well, and frankly I do not believe it explains away the larger mania. But my point is that no person (or trader) is an island. They can make it out of this crisis (with everyone’s savings, as you put it, but that’s not quite right) but they only make it to the next crisis. They gain absolutely nothing by blowing up the world they live in. Can you provide a less enigmatic response. It makes no sense. Ignorance must be bliss. Where you came up with $100,000 per house sold, I cannot imagine. The credits are being used primarily to buy — drum roll — toxic assets, which is to say, REO and short sales. Those are primarily entry level homes. It would be surprising if the cost is as much as $10,000 per home sold. You need to quit listening to ignoramuses and fools. I believe the point is that most people who bought would have bought anyway, and the additional demand created by the credit was very small. You need to start reading the articles you are commenting on. There is a sacrosanct principle that if something is toxic you need to make the polluters to pay. Negative externalities of finance undustry need to be compensated by imposing pigouvian taxes on their products. About the credit system, Karl Marx explained why the large banks are bigger, more powerful, and more concentrated than ever before. He describes in his communist manifesto, the ten steps necessary to destroy a free enterprise system and replace it with a system of omnipotent government power, so as to effect a communist socialist state. Those ten steps are known as the Ten Planks of The Communist Manifesto. Read the fifth plank on Centralization of credit in the hands of the state, by means of a national bank with State capital and an exclusive monopoly. It explains the concentration of the credit system which happens via elite of government’s bureaucrats and bankers too interconnected. Nowadays governments buy votes and bankers fund them. How would you also explain large government debts sold to banks and governments which then bail out banks? Is it free market or Marxist communism? Or simply a Ponzi scheme? This is basically confirming what Michael Lewis said last year, right? This is basically a crime committed in plain sight, with Obama and has crew of Keystone Kops standing around twiddling their thumbs and looking slightly embarrassed, but not very embarrassed because the mainstream media is run by liberal arts majors who can’t add single digit numbers together. Right? Somehow I am both a conventional, lazy thinker and enigmatic? Wow. There were, no doubt, many brilliant and sociopathic traders who deliberately blew up specific credit vehicles and mande a bundle of money. But people somehow manage to get from those anecdotes to believing that this entire crisis was a giant hedge fund conspiracy. If you want to advocate for this as the source of easy money, explain away monetary policy at the time first. To the extent that this crisis is setting the stage for another bigger crisis that puts our political and financial institutions at stake, those investors’ spoils will be short-lived. The financial vampire squid kills the host to ensure it’s own survival not unlike viral replication. Not unpopular sentiment so much as popular sentimentality. In a hopelessly corrupt system ruled by corporate greed and organized criminality, what individual people think about, quite properly, is personal survival. Do they buy sh*tty little cars and hope not to be squashed by the next over worked trucker falling asleep on the Interstate? Do they conserve toilet paper while Gores and Kennedys jet around lecturing them on how to save the planet? No, but what they do is become teary eyed over fatuous flag waving appeals, thus energizing exponentially the criminals who redirect this booboisie patriotism to the bank. What we have is a stupidity problem, not a selfishness problem. As for squandering resources, what else has globalization ever been about? “Ten years before this latest crisis, the U.S. government engineered the bailout of a financial firm that had borrowed billions of dollars to make big bets on exotic securities. The firm was a hedge fund called Long-Term Capital Management. James G. Rickards, as the firm’s top lawyer, negotiated the terms of the $3.6 billion deal, organized by the Federal Reserve Bank of New York, that forced other Wall Street firms to bail out LTCM. But instead, he notes, “the government did just the opposite. Glass-Steagall was repealed in 1999, so that banks could become hedge funds. The Commodities Futures Modernization Act of 2000 permitted the creation of more unregulated derivatives. The Basel II Accords [a global bank regulatory framework] and changes in SEC regulations 2004 permitted more leverage. The reason that “take your medicine” will never play is that it doesn’t benefit anyone in the short term, and nobody really cares about anything but the short term. As I’ve said before, the power behind reinflate-the-bubble is that is aligns the short term, what’s-in-it-for-me interests of Washington, Wall Street, and Main Street. If a bubble can be created that gets the Dow back to 14k, gets people employed and buying cheap Chinese-made junk at Walmart again, then it will get Obama re-elected. Nobody cares what happens after that. A major economic meltdown every 80 years with little ones in between is a good deal for the planet. I will take that over the alternative system, which is what, exactly? Everyone loves upside…….. If you have never worked on Wall Street you really are beyond clueless, which are the pundits, regulators, politicians, professors, and general public. So much BS floating around, it is not possible to respond to them all. I will claim the Global System is too complex to be controlled by any central institution, whether government or private, corporate, or hybrid. Anything that is proposed is only on the margins and will have no effect. Which why I laugh at it, and the fervor over crumbs. There are many experts on something, but no experts in everything. That mean exploits, in-efficiencies and ultimately bubbles and busts. Only the delusions of Plutocrats, Autocrats, Technocrats, the Neo-Keynesians, think this beast should be tamed, can be tamed, and somehow the world would be better for all. (After they, old white guys, made all their money, of course) 600 years or more of economic history says otherwise. Humans are Humans and I would rather live now, than some mythical golden past, where life was simpler. That is the main frustrations over the last decade, the lack of control people feel over their lives now. WELL GET OVER IT. No going back and the fun is just beginning, because change is accelerating. Care about others, think critically, learn from mistake. Attachment and aversion are the cause of suffering. Guatama Buddha. Anyone whose passions are not under control will be active participant, on one side or another, of these socially destructive transactions. Some are intentional and malicious and some are just unfortunately unaware. Their degree of culpability is less but it is not absent. Among bankers, the same exists. It is biggotry to lump them all together. But, they each live with their consequences. Those that think they made out like bandits will owe a karmic debt in this life or the next. The amount of the debt will be highest for those most culpable and for whom the looting was greatest. Society is not neutral in this. It may help that karma along, and therefore help the debt to be settled, but should do so without excessive delight. Stiglitz (and James and Simon) need to realize that their audience is the Obamas of the world (and people like me) — people whose sympathies lie to the left of center but wary of irrational radicalism. Rhetoric that unfairly stigmatizes bankers, equates error with criminality (which happens all to frequently in these comments), or overplays class warfare (i.e., the idiotic Main St. vs. Wall Street false dichotomy), only drives that audience away. For example, suggesting that mortgage lending was “bad” solely because it was at bubble prices, is frustrating revisionist history that deeply undermines Stiglitz’s credibility. Yes, in a way, our problem is primarily political, beginning with Gramm-Leach-Bliley (and the end of Glass-Steagall), and continuing to today, when the failure of oligarch banks appears not to have slowed their march to the destruction of America on whit. It is sad to see what has happened to pride in governance in this country in the age of plutocracy. Eloquent voices (Volcker, Warren, Johnson, Stiglitz, etc., etc., etc.) continue to speak, only to be completely left our of political conversation, or relegated to the end of the bench at least. Yes, we now officially have a failed government, where reform has come to mean repackaging, which means an unfettered continuation of the status quo, once the lawyers are done with their own restructuring and restrategizing. The health care reform, and apparently whatever will pass for financial reform would be better off not happening, for they are only forestalling the ultimate collapse of both economic venues. It’s sad, but yes, a vast majority of the folks inside the Beltway are a part of the conspiracy to destroy this country in favor of amoral greed. “The big dirty secret of the securitization world was that there was such a frenetic appetite for more and more subprime loans to repackage into CDOs that the supply of loans had started to lag behind demand. Mortgage derivatives were an easy substitute, since there was no constraint on how many of those could be created, or at least not so long as some market players, such as JPMorgan Chase, were eager to hedge their risk by buying them. Ironically, JPMorgan Chase’s conservative stance on subprime loans thereby enabled others to continue rolling the dice on the mortgage boom, to a far greater degree than would have been possible if their bets had been limited to the world of tangible bonds”.